www.leegunnell.com: The Fantastic Mister Terry Fox. The Fantastic Mister Terry Fox. "Running the Marathon of Hope"
Terry Fox was born in 1958 in Winnipeg, Canada. An active, athletic child, at the age of 18 he developed cancer in his right leg; requiring amputation six inches above the knee. During the next 16 months of recovery and chemotherapy at the British Columbia Cancer Control Agency, Terry - whose fight alone would have caused great sympathy amongst those he met, looked outward with a selfless compassion far beyond his teenage years. Surrounded by the often fatal cancers of those much younger than himself - as well as finding it too much to ignore, he viewed himself as one of the lucky ones. Inspired by the story of an amputee completing the New York Marathon, Terry devised the “Marathon of Hope”. 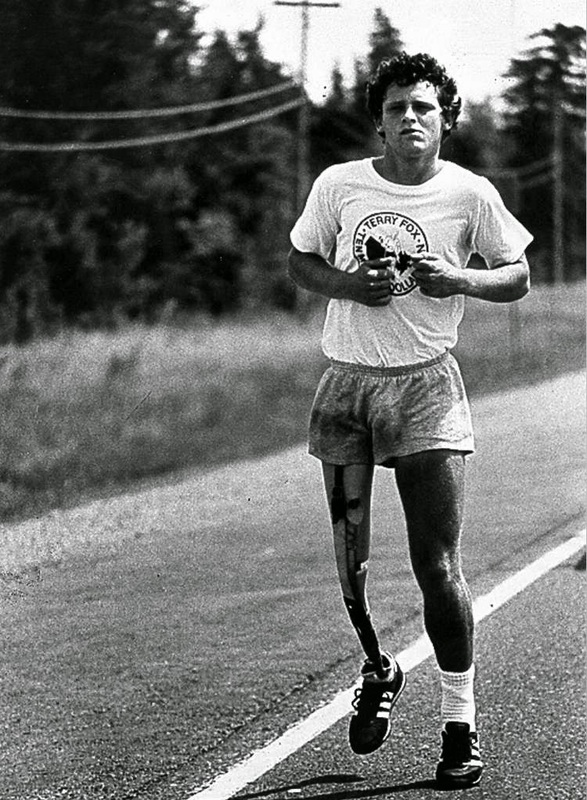 A challenge in which he planned to run the entire 5,000 miles of Canada to raise an initial $1 million dollars – which eventually evolved into $24 million ($1 dollar for every Canadian citizen), for cancer research, the run required 14 months of training and - considering the lack of finance, general interest, difficulty, and Terry's amputation and age, may have seemed absurd. But miracles are always considered crazy before its magical wind catches the world – and Terry was driven by heart, desire, and the deepest overriding factor on his side; faith. On April 12th, 1980 - finally ready to begin his journey, Terry dipped his artificial leg into the Atlantic ocean to begin his coast-to-coast quest across Canada. With only his close friend Doug Alward and his camper van beside him for rest, refreshment and company, the first two months were met with little more than the meagre yet well-intentioned donations from those who happened to see this brave young man on one leg, forcing himself through daily emotional and physically grinding marathons. Terry faced the hardest path on any noble quest; the initial hostility from the same species he was desperately trying to help - misunderstanding the bigger picture for an inconvenient spectre of its frame. Drivers forced him off the road, towns barley acknowledged his journey - with the odd exception, and even a succession of disagreements with partner Doug eventually left them on non-speaking terms. However - like all miracles which are sculpted by persistence, the tide was about to turn. A third into his race - though already amassing over $200,000 dollars, the aim was frustratingly behind schedule. Entering the vast city of Montreal, it was here the inhabitants - and more importantly, the local media, finally stoop up and took notice of a young kid attempting to achieve the impossible. With each run of each day his popularity grew and grew; leaving him a hero, source of inspiration, and national celebrity. Yet for the man himself this was little more than a positive offshoot to raise more funds and awareness. Terry never once lost sight of his goal, and from day 1 till day 143, had completed 3338 miles of his 5000 total; or almost a marathon per day - just as he had set out to achieve. The legacy of Terry Fox lives on in his native Canada. 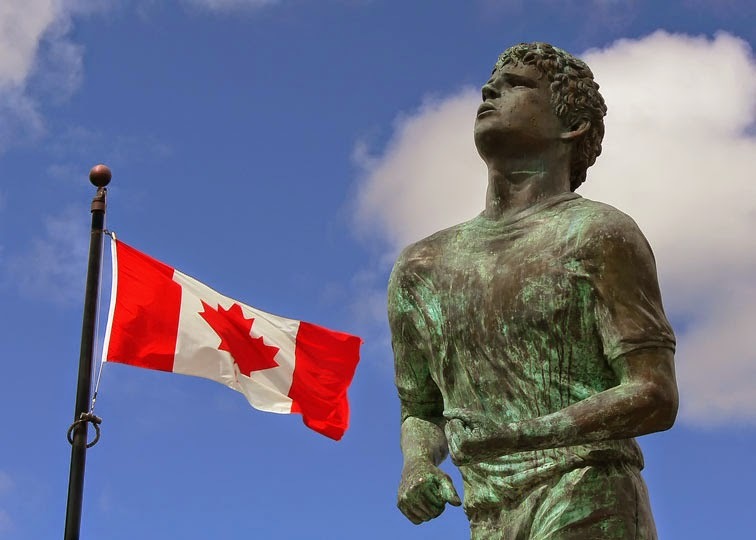 He is a national hero; where schools, roads and buildings are named after him, new statues are regularly erected, and each year since 1981 Terry Fox runs are organized the country over. For a young man who initially intended to raise $1 million, that first stepped toe has risen to a current amount of $600 million dollars raised in his name – and I expect will one day surpass $1 billion.